Kepler Communications has received approval from the FCC to deliver their satellite communication services to the U.S. market — the Toronto-based company received unanimous support during the FCC’s November 15, 2018, Open Commission Meeting and was one of four companies approved during the process. Kepler's PolarConnect™ is a communications solution specifically designed for high latitudes where high bandwidth services are unavailable. 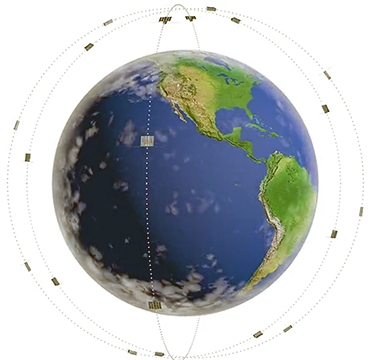 Powered by a fleet of LEO smallsats, PolarConnect™ enables organizations operating at the Earth’s extremes to connect and share information with other regions of the globe. Kepler was originally one of 11 companies to submit a request for access to the U.S. market in November of 2016 as part of the FCC’s processing round for new Non-Geosynchronous Satellite Systems (NGSOs). With the company's first Ku-band NGSO satellite, named KIPP, launched in January of 2018, Kepler is, as of this writing, the only satellite operator that offers pole-to-pole high bandwidth data services. KIPP is capable of delivering upwards of 40 Mbps to 60 cm. diameter VSAT antennas, where the bulk of alternative satellite services peak around 1 Mbps. KIPP will soon be joined on orbit by a sister satellite, CASE, when the latter is launched from the Satish Dhawan Space Centre on India’s Polar Satellite Launch Vehicle (PSLV) later this month. After KIPP and CASE, Kepler is planning to deploy its third satellite TARS in H2 2019 that will be used to deliver their Internet of Things (IoT) connectivity service. Kepler has partnered with Germany’s Deutsche Bahn (DB), the largest railcar operator in Europe, to deliver unique IoT connectivity solutions within DB’s business units. Nicholas Spina, Director of Launch and Regulatory Affairs at Kepler, said that exactly two years to the day after the company submitted the original request, the commissioners voted unanimously to approve the firm's request for market access. This lays the foundation for Kepler to deliver unique services to the American public and the company is thankful for the incredible efforts of the international bureau in supporting the company to achieve this milestone. Kepler has been fortunate to have had great support from the space services team at ISED Canada, the ISED Minister Navdeep Bains, the trade controls bureau at Global Affairs Canada, as well as the management team at the Canadian Space Agency. All of whom tirelessly demonstrated the unwavering support that the Canadian government provides its commercial space industry. Mina Mitry, CEO of Kepler, said that the company's early customers have been icebreakers, tourism companies and scientific organizations that require pole-to-pole high-bandwidth coverage. With the FCC’s approval, the company's connectivity offering to the U.S. public can be expanded. The company can deliver connectivity services to vessel operators such as the U.S. Coast Guard and U.S. Navy, as well as to scientific organizations such as the National Science Foundation. This approval means enhanced U.S. scientific activities and a strengthening of U.S. national security. The FCC approval means Kepler can now formalize partnerships and deliver services with US-based shipping and logistics companies in order to improve asset management within these organizations. This FCC approval was achieved because of the ongoing efforts of Innovation, Science, and Economic Development (ISED) Canada to both support the Canadian space industry, and to further enhance relations between Canada and the United States.